Birthday Wishes for the Incredible Adam Lambert! You are here: Home / More Featured Posts / Birthday Wishes for the Incredible Adam Lambert! Adam Lambert will turn 32 tomorrow, January 29, 2014. This website would like wish Adam the happiest of days as he celebrates, most likely with his core group of friends and family. Thank you sodahead.com for the image! Adam has had a year filled with great professional triumphs. He answered the international demands for appearances, selling out venue after venue. He continued to attract thousands of new fans when he shone on stage with Queen at iHeart. He formed relationships with solid leaders in the industry who speak of Adam with the highest regard. I’m thinking of Grammy winner Nile Rogers, uber producer Avicii, and Glee’s Ryan Murphy, just to name a few. We thought it would be interesting to find out what his fans wish for him as he gets ready to blow the birthday candles out. So on that note, we’re calling for your replies here, and also to Twitter with the hash tag #Wish4AdamLambert. Let’s get trending! I’ll start with mine. I’m also going to post it on my personal Twitter account @cmhagey and our website account, @adamlambertidol. Please add yours too. You never know who might be reading it!! Hugs, kisses & more to you Adam. God to be 32 again. I sincerely wish you the happiest of birthdays & hope to see more & more of you each & every year. Know you more than likely won’t see this, but I adore you from afar. You really have changed the way I think about myself. Happy, happy birthday, Adam. Rock on, Baby & just go cuckoo if you want. When I was your age I sure as hell did. You’re at doll! Love you. The world is a better place with you in it. Happy, Happy Birthday. I hope your day is as special as you are. Much love. Happy Birthday and Many more….still love you! Did you tweet this with the hash tag #Wish4AdamLambert? Hope so! Can’t believe it’s been 5 years since this journey began! I don’t know what to wish someone who’s absolutely perfect. Happy Birthday anyway, ADAM! Happy, happy Birthday Adam. I hope 2014 is your best year yet. Please find a record company so you can put out another album (or produce your own damn record if needed); please sing some concerts with Queen, do a few more Glee show, do a voiceover for Disney or someone like that, find someone to love (I do want to be a Grandma someday, LOL), and just be happy with yourself. We are proud Glamberts! Happy 32nd Birthday! Hi Adam, You are as good looking as always! You are always going to be in your fans hearts! We love you Adam. May God bless you and may you have a very prosperous, healthy, and a happy 2014. By the way, Love the way you sang those tweets or what ever they were on Ellen’s show. She was right when she said you could sing anything!! Love you!! Happy Birthday Adam, it doesn’t seem like it has been almost 5 yrs that you appeared in my life. You really shook up my world, and I am so thankful for that. It’s not many young stars that welcome fans of all ages & make them feel as if life still has a lot to offer. My granddaughter and I did a lot of travelling for your shows. In my 60’s I was excited about something & invigorated, and I thank you. Happy Birthday & I hope you continue to prosper & inspire the entire world. Thank you for being the beautiful human that you are. Enjoy!! Wish for Adam: Warm clothing for when he FINALLY visits/tours NY/NJ (hint, hint). What a journey for Adam and all of us. Here’s hoping it continues in the East Coast so we can all share the glory as we did with Glamnation. You bring so much joy & special lyrical moments that we cherish & admire to all of us Glamberts! I wish you success musically & spiritually this coming year…with continued LOVE & ADMIRATION from us original Glambert & may many more new Glamberts be dancing on the horizon! We all anticipate your new music coming…it’s so damn EXCITING & the anticipation is killing us…BUT…we want you to make sure that when you share…it unfolds the way you feel it should be released before your FAITHFUL & ADORING fans!!! I listen to your beautiful harmony everyday! It just feels like I haven’t filled my day successfully if I don’t. And with great pleasure & FOREVER!!!!!!!!! THANK YOU ADAM…for always being YOU…truly Original, true to self & grateful for your successes. 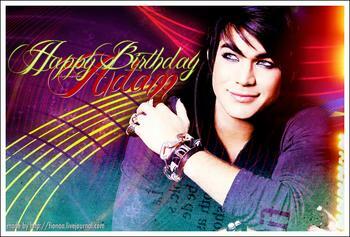 Happy Birthday Adam Lambert…may ALL your dreams come true! Cheers & then CHEERS again! We wish you the best day and year. We have seen you in concert and enjoyed our time with you. Please go on concert again in Houston, TX. We are mother 71 years old and daughter 51 years old have both enjoyed your talent. We have Loved you from the first day we saw you on American Idol. You are so talented and we miss seeing you on stage. All the best from Poland :). I love you :).